Many are well aware of the interconnection the American Western and Japanese Jidaigeki films have, the latter more commonly referred to as ‘Samurai’ flicks in the west. The chambara, AKA sword-fighting films, are beloved by the genre’s fans. The famed Japanese filmmaker Akira Kurosawa didn’t invent the unique feudal era sets of samurai cinema, but he stylized them to a degree that made them epic. Kurosawa himself noted he was partly influenced with John Ford’s magnificent westerns. His ‘Easterns’, the types of films he became widely known for, still gather fans across the globe. A natural reaction. It shouldn’t surprise the type of lone hero in each of these singular genres would be a shared point of reference. Remakes by occidental filmmakers then were an understandable rejoinder. The most famous and successful being John Sturges‘ The Magnificent Seven (1960) and Sergio Leone‘s A Fistful of Dollars (1964) were based on Kurosawa’s stellar Seven Samurai (1954) and Yojimbo (1961), respectively. As you can see, Hollywood’s penchant for remaking successful foreign film has been decades old. Such fare engendered its own success. The Sturges and Leone westerns having attained their own honor within this venerable staple of Hollywood. Then there are those who achieve their own notoriety and/or neglect. The forgotten The Master Gunfighter (1975) certainly. Movie westerns, assuming Japanese period tales, didn’t push their type of film beyond its own conventions and tropes. The katana sword of a samurai became the six-shooter out west. A clean, neat, if a strangely and culturally appropriate, swap out. Here, filmmaker Tom Laughlin, as usual, bent the rules. Incorporating both through some imaginative (some would argue inane) concoction of story to make swordplay (teaming both European rapiers and cutlasses with Japanese katanas) dovetail with the use of black powder pistols. Somehow making it fit into a far out west coast California setting. What can I say? It was the 70s (since it’s going to come up some more, let’s agree to shorten that to IWT70s, shall we?). Oh, and what’s its connection with the above set of film, you may wonder? 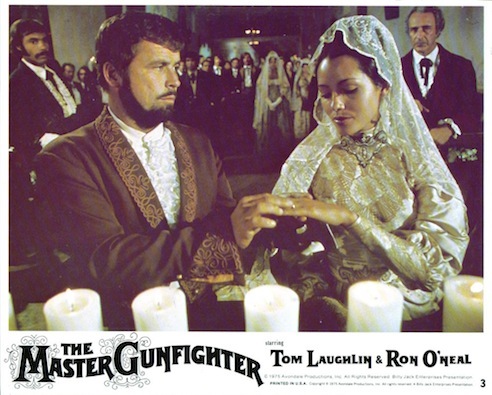 The Master Gunfighter was a nearly scene-for-scene remake of the classic 1969 chambara, Goyokin. The same film co-written and directed by another great Japanese filmmaker, Hideo Gosha. A director American audiences aren’t as acquainted with compared to the likes of Kurosawa. But he should be. 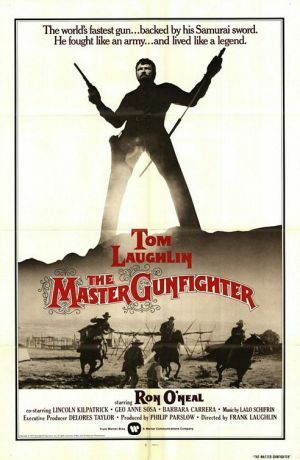 That said, I am not now or ever comparing the director of The Master Gunfighter, Frank Laughlin (son of Tom) to any of the legendary film figures mentioned. No, the 1975 remake was a somewhat successful and less than totally satisfying bit of filmmaking. Roger Ebert gave it his usual deft look (albeit before he screened Gosha’s source film, I reckon) and covered its downsides. For me though, it’s still an oddly intriguing film these many years later — and I was one of those who bought a first-run ticket to this curiosity. I’m sure my duo-post colleague Rachel could come up with rules for a drinking game tied to it. Say when the lead actor strikes some somber pose holding either a sword or gun in hand. Or catching actors using disco-era vernacular. Plenty to go around to get you sloshed, and quick. And speaking about the 70s, the whole reason behind this came from one uniquely independent filmmaker. Billy Jack himself, Tom Laughlin, after screening Goyokin and the underrated Red Sun. Quick synopsis: A samurai…er, gunfighter overcome with guilt over his unwitting part in a massacre of a small village three years earlier seeks anonymity. Now a ronin performer displaying his skills to earn money, he learns, after an attempt on his life, of a scheme by his old clan family to repeat the same crime for more gold. Determined to stop them, he endures great hardships in an attempt to atone for his earlier mistakes and prevent further bloodshed. That he holsters “…a remarkable six-chambered, double-action pistol that fired twelve repeating bullets” (and seemingly never reloads) and held “…mastery of the technique of the samurai sword, as well”, you can see where this was going. IWT70s. Yet, for its ludicrous set-up, it’s a strangely entertaining piece of cinema. What made that possible was the filmmaker’s reverence for the source material. As with Goyokin, Laughlin repeated just about all of Gosha’s motifs. Crows as symbols of death, the muddy streets for corruption permeate both. Others, too, including the worst, or perhaps loveliest, surface ever for cutting fish (draped across a maiden’s thighs) carried over. Including the famous cut hat reveal of the hero (editor takes a drink). Delores Taylor, Tom Laughlin’s wife, spotted Barbara Carrera in a fashion layout. The Nicarguan-born Carrera having graced Vogue and Harper’s Bazaar by this time. Though respectful, the film didn’t exactly light it up, the action “…so badly staged and photographed we’re not even sure Laughlin could handle a steak knife”, Ebert quipped. No, its strength lay with its cast and a deft weave of real history. Besides those already mentioned, Barbara Carrera, in her film debut, and another 70s legend, Superfly himself, Ron O’Neal, stood out. Taking the Japanese tale and relocating it to early California was its other saving grace. Tom Laughlin always wore his sentiments and political principles on his sleeve in whatever film he produced and promoted (Born Losers, Billy Jack, The Trial of Billy Jack, Billy Jack Goes To Washington). As he did once more. Too unbelievable, you say? Laughlin used a true incident in the early 1800s that occurred in the vicinity of Goleta, California involving the massacre of Native people to fuel his version. Should also be noted, this production probably employed the highest number of latino actors and Native people for the time. By all appearances, Tom made a point to speak of the travails mission life had on the Chumash people. You got to give it to him, the independent filmmaker believed in his ideals, causes, and work. Handsomely shot by Jack Marta along the spectacular Monterey coastal area (its geography a little off as Goleta is over 200 miles to the south, but let’s not dwell), The Master Gunfighter did have its moments. Mostly around its charismatic cast (ah…maybe not Tom) and the film’s distinctive use of the history you’ll never hear about from the California Office of Tourism. I can’t say with a straight face that it’s a must-see movie, but it does charm…some of us. Even so, its bleeding heart adaptation of a Japanese samurai classic made it the most unique among the Eastern-into-Western remakes that have come down the pike. One to behold…maybe. Your mileage may vary. If you take me up and watch the film (Netflix had it on disc and streaming1), and drink yourself into a stupor, this releases my liability. Hey, it was the 70s! To paraphrase some old and time honored, between the platters DJ patter. You are “ripping the mold off the old gold” with this straightforward critique of an absolute curiosity and oddity! I caught ‘The Master Gunfighter’ ages ago at a “Dusk to Dawn” marathon at a Little Rock Drive-In theater back in 1975. And still don’t know where to place this celluloid singularity. Neat pistols? Sure. Better than average interactions and gunfights? Certainly. Memorable and well executed cinematography? Absolutely! Characters you care about? Yes, but only barely. More for Ron O’Neal than Tom Laughlin. Continuity of story? Could stand some tweaking. Plot? Not so much. But the film still works! Though I would be hard pressed to tell you why or how. Well executed piece of work for a film anomaly, my friend! I wondered if anyone else had seen this but me. Glad to hear it, Kevin! I agree with your assessment. The more I re-watch this film, the more I side with Ron O’Neal’s Paulo. Maybe it’s a charisma thing ;-). Thank you very much, my friend. I raise my glass for a toast to one helluva review here! Just fantastic. And, do you know, I’ve actually seen this one!!! How astonishing! Westerns are not my thing so the number I have seen is quite low but this is one. Of course, if you had asked me about it yesterday I would have said, huh? But reading your review brought it all back. And let’s raise a glass to the 70s! An excellent decade, if I do say so myself, for wonderful vintages. Another one who’s seen this! I’m so overjoyed. Well, it was the 70s ;-). A great vintage, indeed. Thanks, Rachel. I echo both Jack and Rachel here, Michael. Westerns don’t immediately appeal to me but this one sounds like it’s worth a watch. All the symbolism sounds intriguing. Well done! Oh, yeah. I think it a fun watch, certainly. Screen this and perhaps you’ll give Goyokin a try in response. The original a true classic of Japanese cinema. Many thanks for the read, comment, and RT, Ruth :-). I’ve never heard of this one either and I’ve been itching to watch a western lately. I started watching True Grit again the other night. I think this one will be one I watch soon. Thanks for bringing it to light for me! This is one unique western, T. I do hope you like it, if you give it a go. Thanks, my friend.